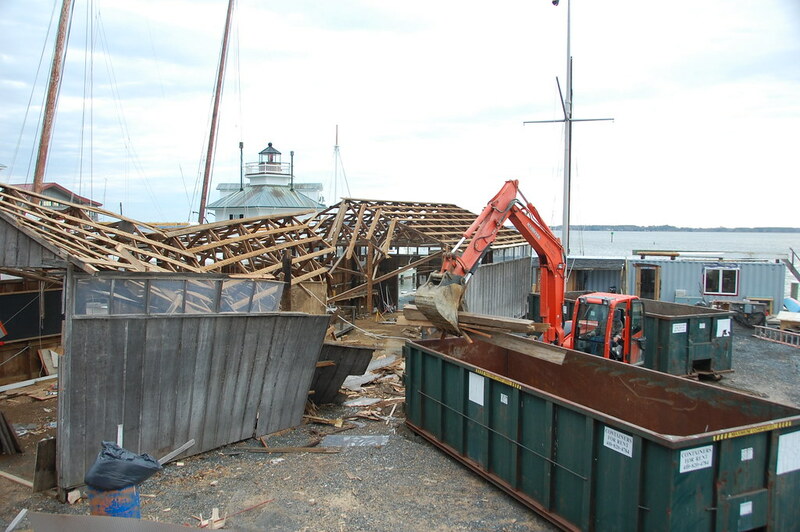 On February 29, 2016, the Chesapeake Bay Maritime Museum had the pole shed demolished in the boatyard. The building has to be removed to make room for the historic 2016-2018 restoration of the 1889 bugeye Edna E. Lockwood. Shipwrights and volunteers salvaged as much of the wood before the demolition. The building was built as a temporary structure more than 30 years ago, and suffered rot and termite damage in much of the timbers. Learn more about the historic restoration of the log-built 1889 bugeye Edna E. Lockwood, a National Historic Landmark as the last of her kind, and the queen of the Museum's fleet at bit.ly/ednalockwood.